Our Ski School “Scuola Di Sci Monte Rosa” has 8 highly qualified instructors, most of whom speak English, each with a different specialist skill so that we can match your needs with the most appropriate teacher. They are also great fun and make every lesson entertaining. Established in 1989, we celebrated our 20th anniversary in December 2009. 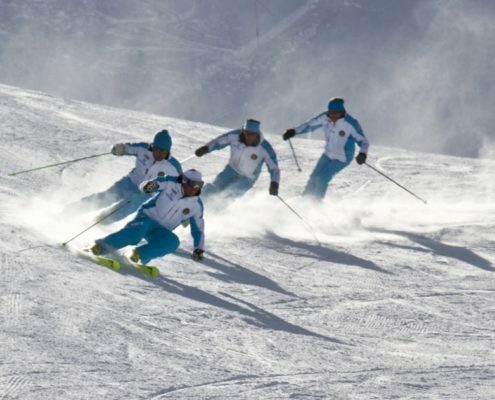 Whatever your starting ability, the ski school instructors will stretch you to your limits and under their expert guidance you will make fast progress. We teach children from the age of 4 and would suggest that you book at least a couple of private lessons for your child to start with as this will allow them to develop their confidence before moving to a larger group where they can have fun mixing with other children as they progress. 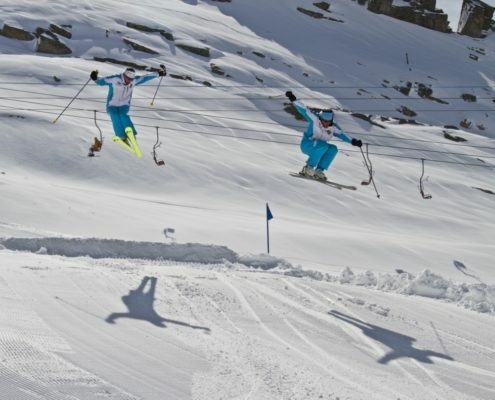 Who knows, you may have the next downhill ski champion on your hands!!! Ski School must be booked locally. Our Ski School is based in the Hotel Flora where Fabio, our ski school director has an office and will be pleased to welcome you and arrange your lessons. We also organise heliskiing courses for groups of 4 people or more. Contact Katharine for more details.